While we all enjoy the benefits that the digital age – and most of all the Internet – has brought us, there are downsides to consider, as with all such things. Indeed, the subject of online security – in relation to both personal users and businesses – is much discussed, and rightly so. We all, often without thinking about it, share and store information online that could be considered sensitive: bank details, personal information and much more are readily used without a moment’s thought. However, do we take enough precautions to make sure that information is secure? 1 Why Use a VPN? 3 How Does VPN4All Work? It is an oft-repeated assertion that nothing transmitted online can be 100% secure, and that is of course true, but we can all do more to protect our online data. One way to do so, and it is becoming more commonplace, is to invest in a virtual private network, or VPN. The benefits are many: when you go online and try and access a website your IP address – a code unique to you – is used to identify you. This address contains a great deal of information about you, where you are, and what you want to do online. It is also a primary target for those who may be interested in your personal data. A VPN allows you to access the web anonymously, by way of varying not just the IP address but also the very location of the server you use to transmit and receive the required information. Thus, when using a VPN, you could be anyone, and you could be anywhere you want. A further benefit of a VPN lies in the fact that as the server can be in one of many countries, so the user can bypass any geographical limitations on content. For example, some users will find that YouTube content is not accessible from their country: by choosing a server in a country where it is permitted they overcome this problem. We took the time to look at the many VPN providers on the market – and it is a market that is fast growing – and found some very impressive options, not least the one we are going to talk to you about, VPN4All. It is a fact that the average person spends about 60% of a working day on the Internet. We all use email for business purposes – and sometimes for personal use – and we like to access social networking sites such as Facebook or Twitter among others. You may also be occasionally visiting some other websites and blogs that are of interest to you, and every time you browse the World Wide Web, you allow access to your private data to countless services and websites around the world. En route to its final target, your data is passed through dozens of networks, routers and hops. Your data is logged at various checkpoints along the way. The fact that your data is stored – no matter how securely – by your ISP means that, at some point on the journey, it is always going to be vulnerable. This is why a VPN becomes important. Your ISP generally limits the user’s access to certain services and Internet resources. You may also find that some websites collect personal data and use it for various purposes. There is also the added risk of hackers snooping on your online activity looking to compromise your data and cause damage to your reputation. Also, with the rise of public WiFi hotspots, personal information becomes even more vulnerable. Therefore, you can see that none of your data is fully safe. This is why we need to talk about VPN4All. By using military-grade encryption methods VPN4All gives your data the best possible security you can find. Data is tunnelled through one of their secure VPN servers that make your data impenetrable to attacks and safe from unauthorized content analysis, monitoring and logging. 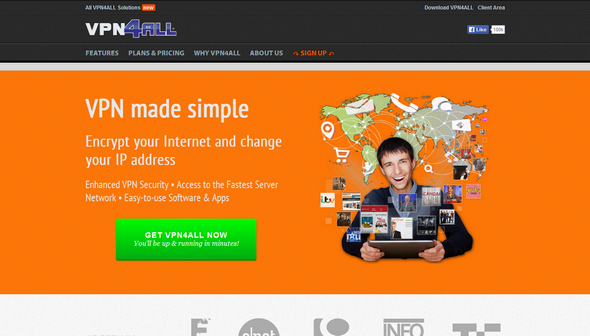 Using VPN4All there will be no limits or restrictions, at the same time ensuring total security. Upon connection, VPN4All penetrates the public networks connecting your computer to a secure VPN network by creating an encrypted tunnel. This encryption is among the most important aspects of the VPN service. After reaching the secure VPN network, the traffic is transmitted from the VPN4All server after being assigned a brand new IP. This new IP is a shared IP, the same as that of various other VPN4All users. This function provides you with total online anonymity.